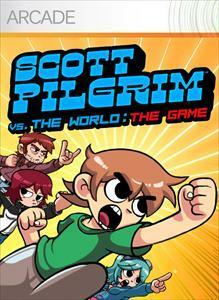 "SCOTT PILGRIM is the ROCK-N-ROLL ACTION LOVE-STORY for the 8-BIT GENERATION. Scott Pilgrim is a lovable loser and the best fighter in the province. He is in love with Ramona Flowers. But she has baggage! To get the girl, Scott must defeat the League of Ramona’s evil exes. Be prepared for some serious action... - Team-up with up to 3 of your friends as SCOTT, RAMONA, STEPHEN and KIM, each with their own signature moves and attacks. - 8-BIT animations by the world-famous Pixel Artist PAUL ROBERTSON. - More than 30 original music tracks by chiptune heroes ANAMANAGUCHI."